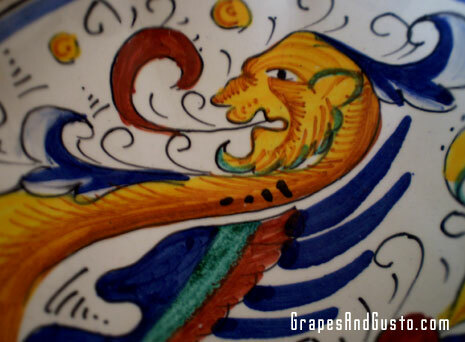 This lively, stylized dragon is a signature mark on the classic Raffaellesco pattern used on many Deruta majolica pieces. Pictured here is a plate from my personal collection. Who am I to judge those who obsess over the dining chairs of an obscure designer, or those deranged fans of discontinued lipstick shades, hunting down the last remaining world supply with cold-sweat fervor? Not I. I will readily own up to my own unique brand of fascination: Italian majolica (pronounced “maYOLica”, and sometimes spelled maiolica). Majolica is pottery painted in a protected Renaissance tradition in the town of Deruta, in the region of Umbria. For those cooking-lesson villa renters out there, and fans of “Under the Tuscan Sun,” you may know Umbria as the region just southeast of Tuscany. But Deruta pottery is so much more than some hand-painted flourishes scrawled on a fruit bowl. Deruta pottery comes in a variety of historic designs, which I will point out shortly. But aside from the rich tradition surrounding Deruta wares, I make the audacious claim that a Deruta dinner plate changed my life. Yes – and from an early age, too. As a child, I used to play at the home of our family friends where I discovered an untapped passion. This couple has led tours to Italy for many years, particularly based around the Renaissance capital of Florence. In their home, I grew up gazing at the large, glamorous photos of them standing proudly in front of medieval architecture, and with wind-blown smiles atop city panoramas. Dressed in stylish gear, gelato in hand, they posed on gondolas and beside clock towers. I loved being in their home, surrounded by volumes of glossy art books, and the cozy luxury of rugs and artwork in every cranny. But perhaps most of all, it was their elegant, stylish dinner parties (viewed from my vantage point at the “kids’ table”) that intrigued me the most. This is where I witnessed their never-ending parade of Deruta pottery: ceramic candlesticks whose colorful designs glowed amid the din of group laughter; platters sturdy enough to hold plump piles of veal piccata and hearty helpings of pesto linguine, and yet charming and poised enough to grace a table fit for Company. Damn the kids’ table, I thought, as I gazed at my hot dogs n’ beans. It was during one of these entertaining affairs that I first saw it: Raffaellesco, the pattern of my dreams. Lively, stylized dragons with tapering tails in rich shades of golden maize, accented with cobalt, brown and teal. More ornamentation than a Bach fugue, but it all worked cleanly against the crisp, white background. This is truly the spirit of the Renaissance, captured perfectly! I remember thinking, as I reached the flashpoint of my lifelong love of the Italian Renaissance. The Raffaellesco pattern offers an experience both visually and energetically. It is regal and stately, yet fun and dynamic – a satisfying combination for those with modern formal tastes. In this detail from an authentic Deruta plate, you can see the brushstrokes indicating true, hand-painted workmanship. The name Raffaellesco is attributed to the Renaissance artist Raphael, who was thought to have painted a benevolent sea god meant to protect seafaring merchants on their journeys. The design stuck, as it is one of Deruta’s most famed and popular designs. Other classic Deruta designs include the colorful Ricco Deruta, considered the oldest and most traditional pattern in the Deruta tradition; Orvieto, a nod to rustic living with its cheerful, green roosters; Siena, an elegant, black-bordered collection featuring medieval-style flora and fauna; and the lively Arrabesco pattern, featuring birds and freeform decorations that evoke a more contemporary sensibility. The town of Deruta takes its pottery traditions very seriously. The city houses what is widely considered the world’s foremost authority for the teaching of the Deruta majolica technique, the International School of Ceramic Art “Romero Ranieri.” All authentically created, local majolica pieces contain a special “Deruta” signature on their underside, usually hand-painted rather than stamped. 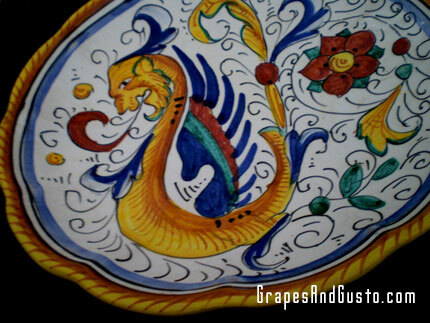 The producers must follow strict design guidelines if they are to label their majolica pieces in the classic series. This handiwork does not come cheap, and even within the regulated producers, there is a spectrum of quality and refinement. For the real deal, expect to pay at least $100 for a dinner plate (yes, one dinner plate). Recently, after a two year investigation, the Italian police uncovered a Deruta fraud ring. According to a March 10, 2010 article published at ThatsArte.com’s blog by Tiziana, “last February…Italian police charged the owners of three companies located in Assisi and Deruta with fraud and other administrative crimes. 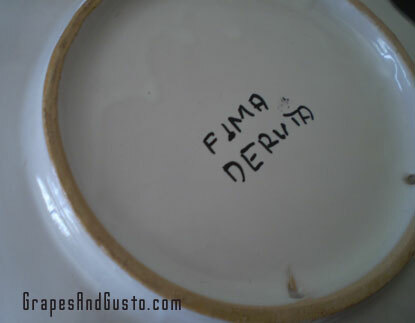 They manufactured fake Raffaellesco and Ricco Deruta pottery that was then partly sold to bus loads of unaware tourists visiting Assisi, partly exported to Europe, Japan and to the US at competitive prices.” The police seized over 2000 pieces that bore the coveted “Handpainted in Deruta” signature but which were actually decal transfer work. The dramatic world of art fraud is far-reaching, I’m afraid. I have encountered several knock-offs in some of my own local home furnishing stores. It is easy to spot these knock-offs if you look closely. You will be able to see a tiny “dot matrix” printing texture instead of a smooth series of brushstrokes. To this, they will often hand-paint the rim of the plate which may add more of an authentic look to the unsuspecting eye. Sure, these are priced quite inexpensively, but like first-class air travel, once you’ve experienced the real deal, it’s hard to go back. This hand-signed mark on the underside of a Deruta majolica piece indicates authenticity. Not surprisingly, I ended up spending a blissful semester in Florence during my college days. I was thrilled when I found an affordable Deruta (or was I duped into buying “Deruta style”?) vendor stand in one of the piazzas. I bought a small Raffaellesco plate, but it then broke in transit back to the States. Since then, I have thirsted for more Deruta to ease that early disappointment. But a funny thing happens with these types of pursuits. Suddenly, one piece is no longer enough. The most insidious part of a “Deruta-ddiction” is that these beautiful pieces are also functional. The rationalizations can get out of hand. I mean, who couldn’t use a mezzaluna (crescent-shaped) cookie dish around the house, or a hand-painted biscotti jar to catch someone’s hands in? Come on, you know you want a rooster-shaped pitcher. To purchase Italian majolica in the U.S., visit the website of Biordi in San Francisco, California. There are many other purveyors of Italian majolica in the U.S., but Biordi carries some of the finest examples of majolica from Deruta and other regions. Their inventory spans from classic to more contemporary styles, and many items beyond tableware. You can even commission your own designs through them. © Gilat Ben-Dor, 2010. All rights reserved. So interesting! I have a tea cup and saucer. I’ll have to check the bottom of it. Oh, and I’m still chuckling about the hot dogs n’ beans comment . Hi, Lisa – It is likely that your Deruta-style coffee mugs are from Torgiano near Perugia (hence the Pg abbreviation). Torgiano is located in the Italian region of Umbria, and is best known for its wine and olive oil — not ceramics, but I am not familiar with a ceramic location called Corgiano with a “c”. I am more familiar with the Deruta pieces so for the most accurate assessment, I would contact a seasoned Italian majolica retailer such as Biordi in San Francisco. Perhaps you can give them a call.